In amongst the machinery and materials of a leather studio in East London, we talk with Benj Lee, model, entrepreneur and one half of menswear brand Passavant and Lee, to discuss the makings of a transatlantic enterprise and the manufacturing of their luxury wares. As you walk into the factory, the first thing to hit you is the rich smell of new leather. Endless reams in every conceivable shade stacked high up the walls from floor to ceiling, the centre of the stockroom equally busy with irregular off-cuts stored in old weathered wooden trunks that look like they belong to a steam train. There’s a bustle about the place as the team get to work on executing the latest Passavant and Lee designs to uncompromising standards. Founded by its namesakes, Jon Passavant and Benj Lee, both models and entrepreneurs working in New York, Passavant and Lee is a brand built on the values of heritage, innovation and craftsmanship. An American, Jon, and Englishman, Benj, together they’ve created products that embrace their dual heritage; designed in New York, each Passavant and Lee product is hand finished here in London. We met up with founder, Benj, to discuss how it all started, and what’s next. How did Passavant and Lee come about? Most importantly, the brand grew out of our friendship. Jon Passavant and I became friends when my wife and I left London for a short adventure in New York... which turned out to be a very long adventure in New York. It was our shared enjoyment and appreciation of certain things that gradually led from casual conversations to setting up the brand. We had both worked in fashion for over a decade, but on the modeling side of things, which gives a unique perspective and insight into the industry, as well as, of course, intimate exposure to all the best luxury brands. We felt we could bring a unique aesthetic to the market and wanted to build a brand based on our shared values, but differing heritages. Your products are designed in New York but made in London. How does this dual identity contribute to the philosophy of your brand? The brand has an underpinning of traditional British leatherwork and the sartorial consciousness of London, where I grew up. Certainly, the history of the City of London and the culture of the city plays a role in shaping who we are as a brand, but interwoven in that is the pioneering American spirit of Jon’s roots. Significantly, our design studio is based in New York, but our products are made in London meaning that our transatlantic identity is not just something on paper, but rather something played out every day as we work with our teams on in both cities. The two cities have a lot in common in many ways as centers of commerce, art and culture. How integral were the raw materials that you would use to your brand’s conception? We launched the brand with an intentionally focused offering of one briefcase in two colourways. We wanted to do one thing excellently before expanding our range. As a result, we were able to pour an incredible amount of time and energy into developing that product and honing it to the specifications we wanted. In reimagining the traditional hardshell case we wanted to utilise the age-old materials of aircraft grade aluminium and naturally tanned leather, but bring them together in a refined work case in a way that hadn’t been done before. These materials have sat side by side for more than a century in aircraft, automobiles and the like, and we selected them for much the same reason as they are used there. The specific alloy of aluminium has a unique strength-to-weight ratio making it light yet protective and naturally resistant to corrosion, while the leather carries a natural beauty which only improves with age and use. These materials stand for strength and longevity and when worked together by master craftsmen create not just highly functional accessories but pieces of beauty that our customers can be proud to own. Tell us about the process of designing a piece. What are the commonalities that you want to maintain in the design of each product? Why root production here in London? The physical location of our factory in London – where we spend much of our time – not only reinforces our value of relational sustainability, through close communication and indeed friendship, but it has also been the way that we are able to maintain such high quality throughout our product range. In many ways, time is the true luxury, and the considerable time put into every one of our handmade products is our testament to that. Tell us about your most iconic piece, the No.25 briefcase. 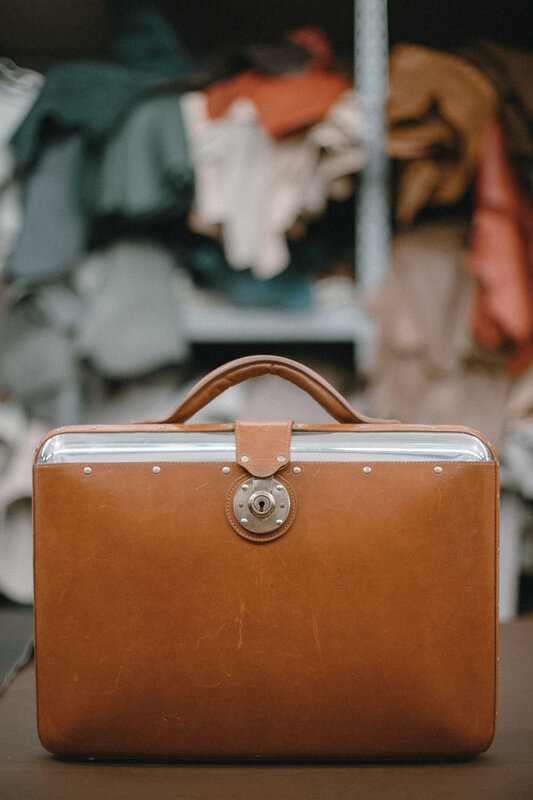 The name of the No.25 Briefcase came about during the product development process when we would communicate with the metal polishers about how much to polish at the top of the shell. In this case, it was the top 2.5 inches and so the name stuck as the No.25. This thin exposed strip of polished metal is perhaps the most eye-catching thing about the briefcase, and gives just a hint of the full shell of aluminium that is otherwise hidden beneath the leather. The shell, while being lightweight, provides complete protection for the contents, and the interior is lined with suede and silk for a refined look and feel. It is a pleasure working with one of the oldest working brass foundries in the UK to make our lock, which is customised to fit the unique curvature of the case. It is cast in solid brass, then plated with sterling silver or 24 karat gold. The lock is certainly a nod to the traditional cases of old, and the very feel and sound of it is timeless. What does the use of aircraft grade of aluminium contribute to your cases? The main purpose of the aluminium shell is to provide protection, but the process of how it is formed is fascinating. It is stamped out of very thin aluminium sheet to keep the weight to a minimum, yielding the perfect shape, but lacking in strength. This piece is then taken and heat treated, or ‘artificially aged’, to increase its strength. Through a lengthy process of multiple bakings in a furnace followed by quenching in liquid the shell is made rigid. The burnt and scarred shell is then hand polished and buffed before the leatherwork can begin. What are you looking for from the leather you select? We were painstaking in our leather selection process. It needed the right amount of stretch and flexibility to be worked effectively round the metal shell, but also enough body to have a sturdy feel. We settled on a fully vegetable tanned leather from a heritage, fifth generation family-run tannery in North America which produces a finish that looks great in its pristine form, but also ages beautifully. Our cedar colour was custom made for us in a tanning process that takes eighty-nine separate steps. I’ll never forget the moment our first batch arrived: the smell of the leather as we unrolled it and then just stared at the hides, as you would works of art. We ship our products free of charge anywhere in the world, and it has been fascinating to see already the diverse spread of our customers. In London, our main stockist is Fortnum and Mason, who we are proud to work with and who epitomise the rich heritage of the UK. In New York, our customers can shop by private appointment, which we always love as it gives the opportunity for interaction and relationship building in an industry that is moving at an ever-increasing speed. As things grow in the years to come, we’re committed to giving the same individual care to our customers as we did at our inception. What do the next five years hold for Passavant and Lee – anything new in the pipeline? I’m hugely excited about what the coming months hold, let alone the coming years. We have a handful of new products in the pipeline; everything from backpacks to weekenders. Each has been a long time in the making and carries the spirit of the brand. I can’t wait to see people’s reactions to them when we launch.